ISLAMABAD: Pakistan Muslim League-Nawaz’s (PML-N) candidate for the slot of prime minister, Shehbaz Sharif, was born on September 23, 1951, in Lahore. According to a TV channel, Shehbaz is a son of Mian Sharif (founder of the Ittefaq Group) and a businessman by profession. Shehbaz Sharif received a Bachelor of Arts degree from the Government College University, Lahore. After graduation, he was elected president of Lahore Chamber of Commerce & Industry in 1985. He has two brothers, former Prime Minister Nawaz Sharif, deceased Abbas Sharif. Sharif was married to his cousin, Nusrat Shehbaz in 1973 and had two sons, Salman and Hamza, and two daughters Javeria and Rabia. Sharif got married in 2003 to Tehmina Durrani. Shahbaz Sharif was elected to the Punjab Provincial Assembly in 1988 and to the National Assembly in 1990. He was again elected to the Punjab Assembly in 1993 and named the leader of the opposition. Elected for the third time in 1997, Shehbaz was sworn in as the chief minister of Punjab on 20 February 1997. After a coup in 1999, Shehbaz Sharif spent years of self-exile in Saudi Arabia, returning to Pakistan in 2007. Shehbaz was appointed as a CM for a second term after the PML-N’s victory in the province in the 2008 general elections. During his tenure, he focused on health, education, agriculture and industrial sectors. He undertook several development projects in Lahore. 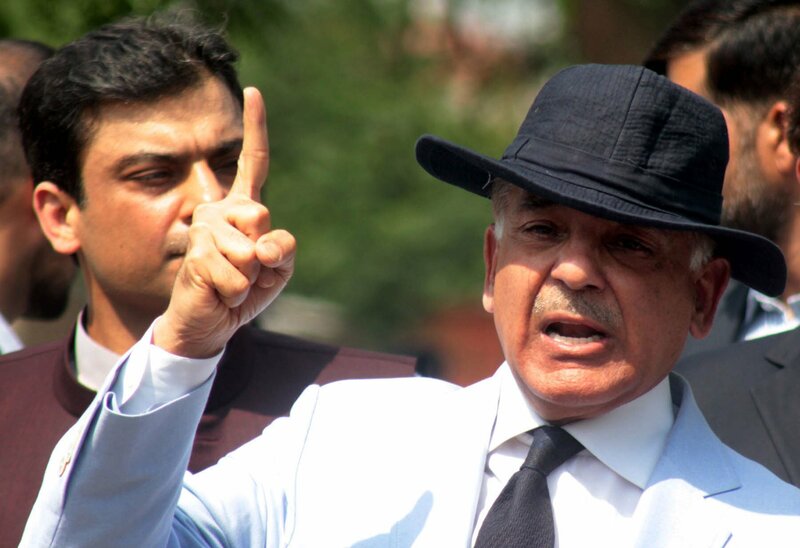 While in exile in Saudi Arabia, Shehbaz was elected as the president of PML-N in August 2002 and moved to the United Kingdom in mid-2003 for medical treatment. He was re-elected as the president of PML-N for a second term in August 2006 and returned to Pakistan along with Nawaz Sharif in November 2007. Shehbaz Sharif was not allowed to take part in the 2008 general election due to some legal proceedings and he was acquitted in the 1998 case. Shehbaz Sharif was elected to the Punjab Assembly for the fourth time from Bhakkar constituency in by-polls held in June 2008 and became chief minister for the second time, unopposed, after securing 265 votes in the 371-members provincial assembly. His second term as the Punjab CM lasted until February 2009, when a three-member bench of the Supreme Court of Pakistan declared him ineligible to contest elections, thereby removed him from office as a chief minister. Later in April 2009, a five-member larger bench of the Supreme Court set aside an earlier decision, in which Shehbaz was disqualified from holding public office. As a result, Shehbaz returned to the office. Shehbaz was elected to the Provincial Assembly of Punjab for the fifth time in 2013 after winning from three Provincial Assembly seats (PP-159, PP-161 and PP-247). He also won one National Assembly seat (NA-129) but he opted to retain his provincial assembly seat PP-159 and became the chief minister of Punjab for the third time, unopposed. In 2016, Shehbaz was elected unopposed as the president of Punjab chapter of PML-N in the intra-party elections. On July 29, 2017, Shehbaz Sharif’s name was forwarded for the post of the prime minister after Nawaz’s ousting. To become eligible for the post, he will have to be a member of the National Assembly. Till his membership to the National Assembly, Shahid Khaqan Abbasi has been nominated as an interim prime minister for 45 days.